Contents: 5 signs including "Good Things to Eat", "Drinks Help Yourself", "Love is sweetTakea Treat", "Please Place your Cards and Gifts Here", "Welcome to the Bridal Shower"
Setting up the bridal shower of her dreams is that much easier with this beautiful set of pink and gold bridal shower signs. Each set comes with five signs of different sayings, including "Good Things to Eat", "Drinks Help Yourself", "Love is sweet Take a Treat", "Place Cards and Gifts Here", and "Welcome to the Bridal Shower". 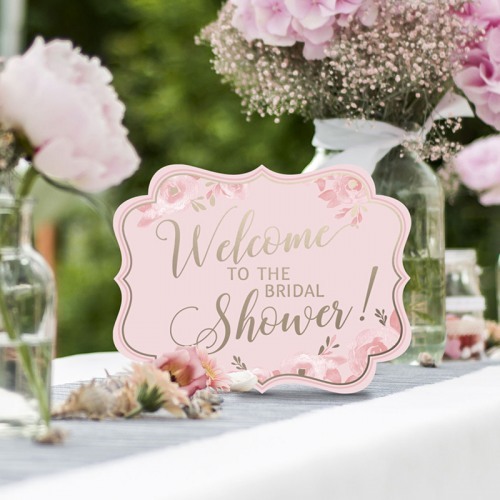 Just add these signs to the right area of the bridal shower to complete the overall look.